The church I go to does a Posada every Advent. 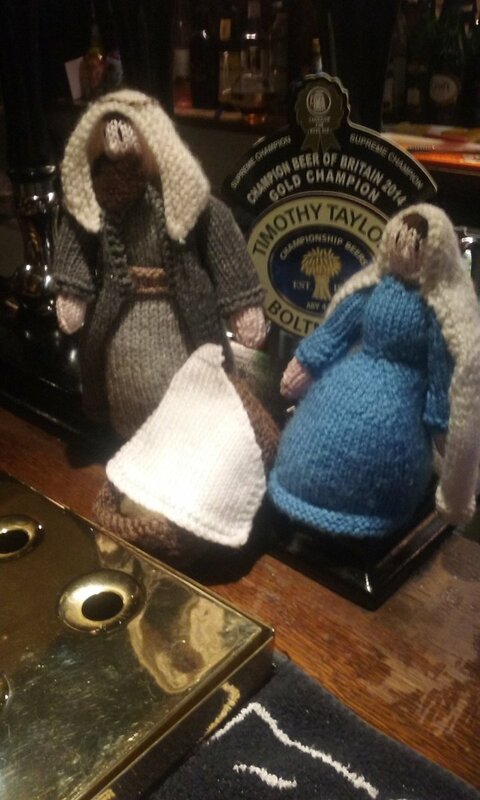 It is a knitted nativity set. Households sign up to take it every night and the people behind it do a really good job of getting everyone to write in a journal, take pictures, light a candle, share a prayer etc etc. We like it; it helps us enter into the season. Ours came on a Friday. I generally go to the pub on the Friday. I suppose I could have kept it at home, safe and sacred as a centrepiece, but I thought I would take some of it to the pub. It was difficult, I guess- doing something like this in the pub, but some entered into it, even if various obscene suggestions were made (don’t ask) about where Jesus was and one person tried to baptise Mary in a pint of beer. I think it was worth it: see the photo above of Jesus with the Landlord of the Inn (geddit?). It got me thinking though: it would have been far easier to keep it at home- less threatening and less potential for embarrassment or accident. But then I thought; that would just be like the rest of us with our Faith…. On the 4th day of Christmas…. I am a day late with this (although on time if I followed the Eastern Calendar), but yesterday was ‘Holy Innocents Day’. I never got that in the tradition I came to faith in and grew in: the liturgical year was remote and a by product of an irrelevant older tradition. I think I get it more now: the year marked into seasons and celebrations which come round year after year. You don’t have to reinvent the wheel in an exhausting drive to be ‘relevant’: rather you just have relax and follow- all human life is there. That is the case with Holy Innocents Day- the day commemorating the strange, brutal and bloody story in Matthew 2:16-8 when Herod massacred all the children in Bethlehem under the age of 2. Whether ‘true’ or not, it is a welcome corrective to the saccharine nature of Christmas as it is celebrated. I do love celebration, parties, food and all the other things that mark Christmas- we need the joy and celebration. However, with no commemoration of the dark side, we can’t even begin to accept that unexplained and viscous suffering is also part of the same story. I remember, years ago, hearing someone read a poem based on this day and it had the line in ‘I wish you’d never come’- I thought that was controversial at the time, but I now I understand more. Years back, when this day fell on the day of a united all-age service, I proposed doing something on this theme and I was overruled: sometimes people cannot take ‘telling it like it is’- even (and sometimes especially) in the church, which I think is one place where doubt, fear, unexplained questions and lament can be safely heard…. …and that is one reason why I started blogging. To be honest, I never thought I’d do it again: preach on Christmas Day. 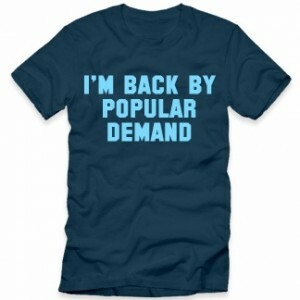 I’d had 15 Christmas Days in a row in the pulpit and then I left pastoral ministry: perhaps never to return. But the opportunity came up and my family (who have made so many compromises for me over 15 years) said yes. So I did. I’d forgotten how hard it was. On the face of it, it is an open goal: Christmas, Jesus, people coming to church in greater numbers than usual and a story that is ‘known’- who wouldn’t want to? But the other side- it is so familiar that people stop listening- you only have to sing a carol and people (including me) are in a world of 3 kings, choral angels, cuddly shepherds in tea towels and an innkeeper saying no room at the inn: none of which are actually in the Biblical stories in that way. It is easy, with a minimum of preparation to put something out there. So you pray, you read the stories again and again…and then deeply…and then try to imagine that you have never heard them before. You read widely; trying to understand the cultural background (shepherds are apparently not cuddly and neither do they wear tea towels). 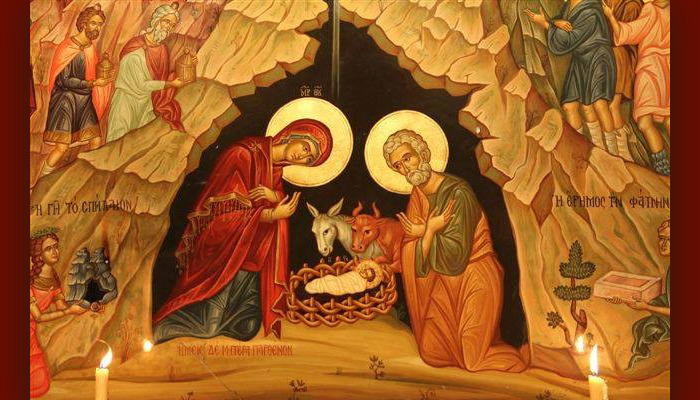 Then you begin to ‘read’ your area, your culture…and not just that inside the churches (try and avoid the temptation of 3 cliches and a bit of Christianese….I will kill if I hear the phrase ‘the babe in the manger’ again). I will never tire of this song; in fact, I have posted it several times. I went through a phase when I found carols to be mawkish, over sentimentalised and theologically inaccurate. Of course, they are all of those- and yet they are something more. It is only now, that I am over 50 that I begin to see it- they are memory. As I sing them, I remember Christmases past; both events that happened and people that are no longer here. I have seen this on wards; people who cannot always cognitively perceive things that well due to memory loss, are able to sing carols word perfectly.People who say that they have little or no faith are unashamedly able to sing carols loudly. we see the beauty in the spark. It is Boxing Day. A day when perhaps the only feeling that many of us have is ‘full’. Days like this call for quietness and reflection. During Advent, I have been having my customary listen to one of Sufjan Stevens’ 5 album Christmas collections. This track from ‘Silver and Gold’ struck me as the ideal listening material for today, this first day of Christmas (yes, you are allowed to hit the first person today who says ‘That’s Christmas over for another year then‘). It is far better than hitting the sales today to buy more stuff that you don’t need to replace the stuff that you are sick with, in my humble opinion. I never thought I’d do this again, but I’m leading worship today (10am, Hutton Rudby Hub, if you are interested). This poet died on Christmas Eve 4 years ago. Even before I knew that fact, I was thinking of using this on Christmas Eve: when I look at nativity plays and see people singing carols , this comes to mind. When I develop severe ‘bah humbug’ in the middle of shops with saccharine Christmas displays with no reference to The Story that led to this season, this comes to mind. And whenever I see adverts that just exhort ‘more, more, more’ to have a ‘perfect family time’ (TM) this comes to mind. scientifically to mitigate His faults. we confess to missing Him at times. aimlessly, a wheel skidding in snow. to ask Shall We Gather at the River? and our contracted hearts lose a beat. about fearing no more the heat of the sun. its stripe-like ribs testifying to rank. the Ave Verum Corpus of the observatory lab. sacrificed anonymously to save life. shiny glasses of red wine. just as the monastery bell begins to take its toll. like hands in Michelangelo’s creation. which Milosz compared to happiness. a matching set of Mother Ann Lee chairs. will recede as the universe expands. riding the evening thermals misses its tug. ponder what their next move should be. after the birds have flown. Author GrahamPosted on December 24, 2016 Categories Christmas, poetryLeave a comment on Christmas Eve poem. This one doesn’t make the top 20 Christmas records or even the top 50, but I think it is beautiful. It starts off as comedy; having a gentle go at religion but then slides into something deeper. My line manager talks of something called ‘an atheist spirituality’; this is not in the sense of anything organised or formal, but the keen awareness of the deeper things of life and a sense of wonder in them. This song never fails to move me, with it’s evocation of family, community and togetherness. *Trying to fit things in that you have put off for a while. Sometimes this is done frenetically. *….creating new lists from some of the things you have crossed off from your ‘to do’ list. *A feeling that things have come to a close or their natural conclusion. They haven’t, of course; it is just the prospect of a break and the year ending that builds this feeling. * a healthy ‘laying down’ of the old year and a letting go. I always managed this in full time ministry- leaving a today desk, changing ansaphone messages/ email away messages etc. It is, however, more marked in a job that takes place away from home. It is also very lovely and a necessary human feeling: the most unhealthy people seem to be those who say ‘I could not possibly stop’. Let it go: ‘cut the chord’. There is also the realisation that I am incredibly fortunate: I can stop work: many of the staff in my organisation work over Christmas- I do have to do a couple of days ‘on call’, but it is not the same. I am also lucky: I go home to a supportive family. Many of the people I serve don’t have that privilege: ‘family’ is a tricky word and ‘home’ will be a hospital. I’ll never quite forget this fact.